OK this one blows me away and I’m going to have to process it. Someone tells me there’s this Hells Angels puppet club in Fort McMurray called the Syndicate. Only unlike Greg Wooley’s Hells Angels puppet club in Montreal called the Syndicate, these guys are all white. In fact some of them appear to be white pride like the other Hells Angels drug traffickers the Whiteboyz Posse. Kinda strange how the white guys would pick the name of a black gang in Montreal but hey, stranger things have happened. Just look at what Bacchus named themselves after. Yo bro that ain’t no Spartan. That’s a roman soldier. A pretty famous one at that. A warm brotherhood indeed. So here we have a Bacchus member from Newfoundland hanging out with the Syndicate in Fort McMurray. A Newfie Bacchus, I’m sure there’s a joke to be told there somewhere. Bacchus in Eastern Canada have quickly attained criminal organization status. So I guess if the Syndicate poses with Buttkiss, that makes them affiliated with a criminal organization. The Fort McMurray today is confirming that the Syndicate does exit there. After Jeffrey Caines received a 14 year sentence for drug trafficking in Fort McMurray, a member of the Ontario Biker Enforcement Unit said: "The Hells Angels have interest in that area because of the drug market and if one person is out of the picture, they will replace them with someone else." Evidently, Fort McMurray is another small town that is suffering from the Hells Angels drug and prostitution trade. The Hells Angels, bringing drugs and prostitution to a small town near you. 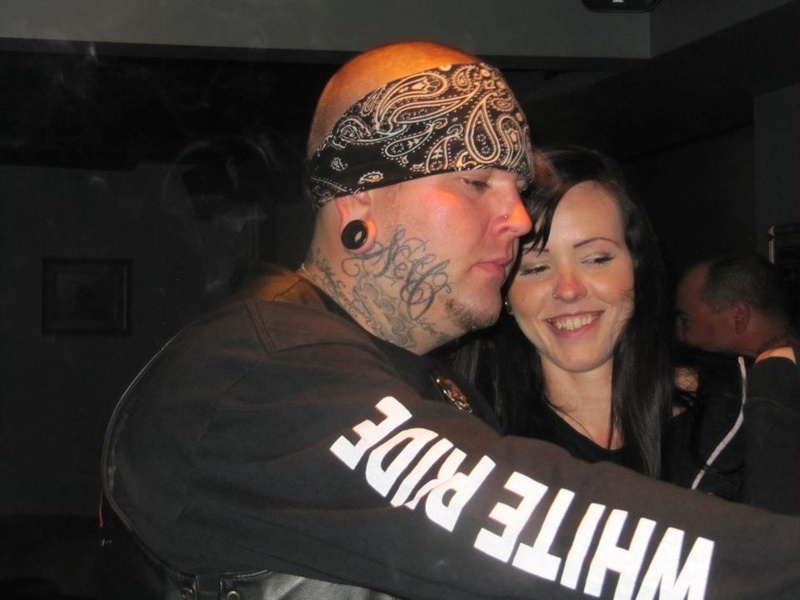 One source claims Cecil (Kristian) MacEachern, the guy with the white Pride shirt is from Glace Bay, Cape Breton and is the one running the Syndicate Mc in Fort Mcmurray. Seemingly Cecil was kicked out in 2009 for being a rat and is now back in charge. They go around town telling everyone that they are the Hells Angels Syndicate and are here to do the HA work. This is Cecil wearing a 1% Southland Hells Angels hoodie. That’s a Hells Angels chapter in Calgary. Notice the red flag in the back pocket. That’s a very outdated tradition along with the fuzzy troll that the black gangs in LA used to use. This is a picture of Cecil and his mother. He always was one sorry SOB. Dion Piercy is a tattooist from Cape Breton and was a big player on the Syndicate coming to Fort Mcmurray. He has since left town and moved to the Edmonton area. He is now on the HA probate program. He too was busted on some fraud charges a few years back and cut a deal with law enforcement to rat out his brother so he could get sent to Poundmaker's Lodge. This is big Jay aka Jason King with the glasses on his head flipping the bird sporting a Syndicate vest. Jay lives in an apartment with his mom and little brother. That’s Ron Clark and Bruce Scrivner. Ron Clark is a long time resident of Fort Mcmurray. It says striker on his vest under Fort McKurray. I wonder if they have a dental plan. Aaron Sweetapple and Mitchell Burry are the Newfies in the very first picture. Mitchell is the one with the Bacchus Newfoundland patch and Aaron is the one with the Syndicate Fort Mcmurray patch. Both are from Glovertown Newfoundland and have both since left Fort Mcmurray. This is Aaron at the Health Science center in St Johns NL drying off his fingers after some serious nose picking with a broken leg. He's not the sharpest tool in the shed. Syndicate Forever Forever Syndicate or at least until the next clown comes along. Just like the Zig Zag crew and LHS. Only they shot their LHS guy themselves. No L&R there. Just money and greed.